OMG Posters! » Archive "El Jefe Alphabet" Art Print by El Jefe Design - OMG Posters! This is pretty great, it’s a classic alphabet poster as only El Jefe could do. 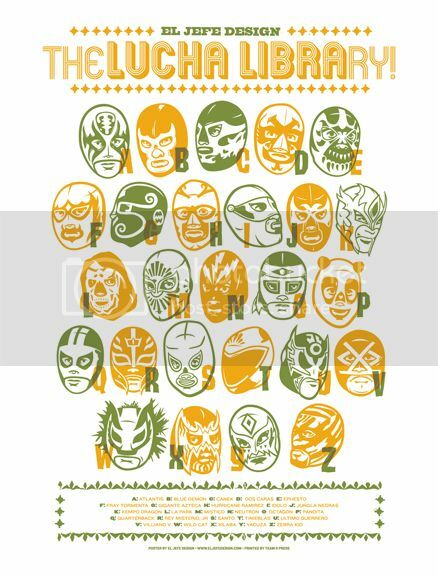 This Lucha Libre themed piece is a 19″ x 25″ screenprint, available in two editions. The green version will cost you $25 shipped, the red will run you $35 shipped. Visit ElJefeDesign.com. EDIT: The green version is limited to 100, the red to 25. Awesome. But why is the red variant 10 dollars more? I’m pretty sure it has a smaller edition, but I’m waiting to hear back on the edition sizes. The green edition is 100 and the red is 25. Thank you for the mention on the page!